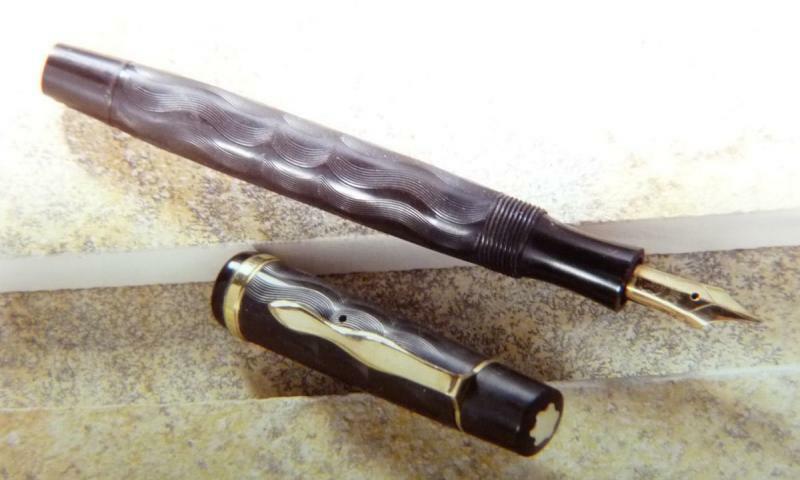 A tiny black and brown fountain pen with some little golden trims. Its a Masterpiece Montblanc, made from 1935 onward. 124 S is imprinted at the barrel end. Lets translate these sucession of numbers and letters. First number signifies the class of pens. a 3XX would be a pen from third series, student quality. A 2xx would be a second class pen, a good quality pen with already better technique. Such a pen does also feature a better nib and an advanced filling system. Our pen however has a 1xx imprinted, which shows its a Meisterstück, a Masterpiece. This highest class of pens was first launched in 1924. Filling system once again is even better, and the nib is a twotone design and clip and trims state a certain luxury. Second digit defines the filling system. A 104 would be a safety filler. A 134 a pistonfiller. Our pen, model 124, features a push knob filling system. It has a rubber bladder as ink reservoir. Technically similar to a Parker Dufold buttonfiller, but the Masterpiece features a blind cap fixed to the barrel. This “push knob” is being screwed out then pushed. A pressure bar inside is bent and the bladder compressed. When released, the bladder fills like an eyedropper. From the same period, say 1934 to 1939, you can find models 104, 124 and 134 - they all show the same design, but the 3 different filling systems. 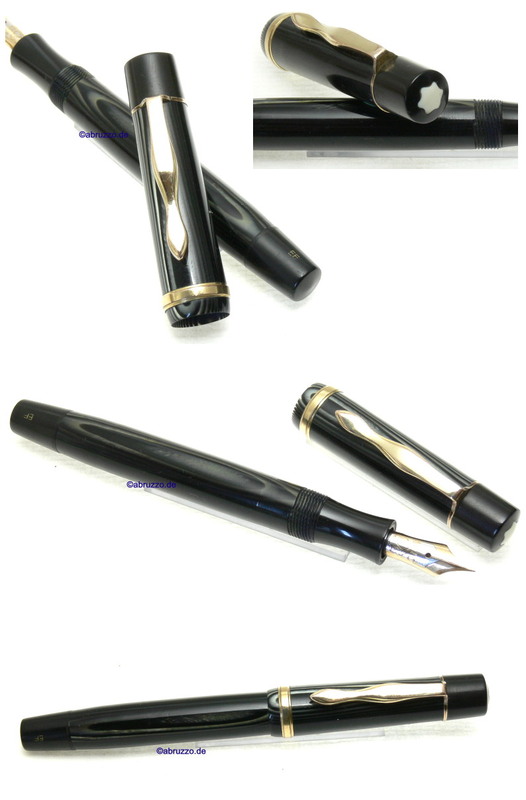 PL would be the Platinum Lined celluloid pen. Yes, the letter G - a 124 G would be a smooth surface (G = Glatt = smooth) ebonite pen. This one here is a regular 124 S with chased barley pattern. About this rare wavy pattern - we have asked several Montblanc gurus - they all had never seen or heard of such a pattern. The pen´s owner himself was most surprised to hear that the pen is that rare and promoted it to a better position in his cabinets full of Waterman pens. I wrote the story for Pen Plus in 1997 - this translation has been overhauled in 2011 with more pictures and more informations added.